If you’re in a business that uses cold storage, you may have zombies in your walk-in coolers and freezers. When you think ‘zombie’ what comes to mind? A slow, lumbering creature that needs lots of energy in the form of defenseless humans to keep going? If so, then watch out – you might have zombies hanging out in your walk-in freezers and coolers. The zombies I’m referring to are shaded-pole motors. This type of motor is common in older commercial refrigeration systems. They’re slow and lumbering and bent on using as much energy as possible. They operate on a brush system which produces a tremendous amount of heat. So, not only are you cooling the box down for your perishables but also for the excessive heat caused by the motors. And there’s not much you can do to fight them off as they slowly and relentlessly attack your utility bill month after month. 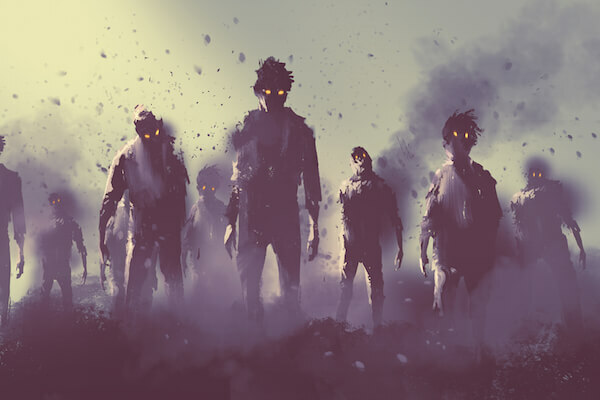 Don’t attempt to fight off zombie shaded-pole motors, and don’t accept defeat either by simply accepting high utility bills as the cost of doing business. Sign up for a No Obligation Energy Assessment. There is no obligation, and the personalized proposal will include recommendations to replace the shaded-pole motors, an energy savings estimate, your ROI, and your rebate amount. It’s sure to get those zombies shaking in their boots. Hire a certified contractor to handle it all. Doing battle solo with energy-zapping zombies can be rough. So while we don’t discourage you from handling the install of new equipment and rebate paperwork yourself, we’ve got your back if you need a partner. We’re trained, certified trade allies with the major utility companies and we can set you on the zombie-free path of energy savings. Reap what you’ve sown. You’ve made the important decision to upgrade your refrigeration system, so now it’s time to breathe easy. Upgrading your walk-in freezers and coolers will lower your energy usage and lower your utility bill— making you look like the brave hero who rid your facility of the walking dead of the refrigeration world: shaded-pole motors. Got questions? We want to hear from you! Want to sign up for a NO OBLIGATION energy assessment? Contact Refrigeration Technologies at 888-286-3091!